We offer a full range of general practice services in the Sutherland Shire. 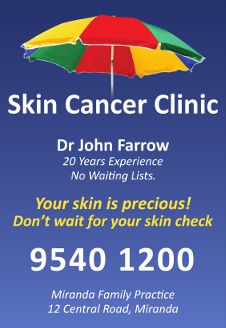 Please call (02) 9540 1200 to book an appointment. Phone contact with the surgery is always welcome. Where immediate contact with your doctor may be disruptive to other consultations, our receptionist will give you the option to hold and speak to your doctor between consultations. Alternatively, arrangements will be made for your call to be returned as soon as possible. In an Emergency you should call 000. In case of emergency phone 000. If you need a home visit from a doctor after surgery hours, please ring our deputising service on (02) 8724 6300. Patients will be bulk billed if you hold a valid Medicare card. Sutherland Hospital Casualty / Emergency Department is open 24 hours and can be contacted on (02) 9540 7111.